A new Dublin edition of the Monopoly board game has seen the capital's residential addresses that have featured since the 1970s wiped from the board, replaced by tourist spots and shopping centres. Around 30 of the capital's landmarks are featured on this version of the board game. Aylesbury Road is no longer the top spot – that honour goes to the GPO. The Phoenix Park covers a much greater area – but comes in 50 Monopoly dollars cheaper. It’s all about location – which explains why the Aviva Stadium is valued higher than the much larger Croke Park. With shops and food outlets taking the place of the staples of yesteryear, some may be left yearning for simpler times. Monopoly Executive Robert Osborne describes the branded additions as commercial partnerships, and maintains the game hasn’t strayed too far from the original. He said it wasn't possible to include every place of interest, but the makers are very happy with the end result. "Temple Bar of course is on there. You've got a great array of education partners. You've got places like Arnott's. "You've got Guinness Storehouse. You've got Dublin Zoo. So all of the family favourites within Dublin. "And of course, it's really difficult, Dublin is a beautiful city with lots of things to do, so there are so things that missed out and we're really sorry for those that did miss out. "But the board itself looks great, we're really happy with it." 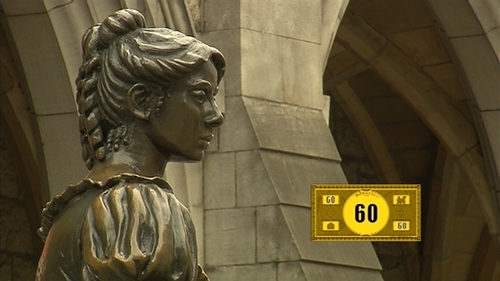 However, spare a thought for Molly Malone – the tourist favourite is the cheapest square on the board.